New for Autumn Winter 2017, the men’s Rador & Women’s Selen jackets bring versatility and durability to Sprayway’s insulation categories. These extremely versatile micro baffle jackets use loose blown synthetic insulation, offering superb warmth and comfort while easily compressible into their own stuff sacks to be packed away ready for when the temperature drops. Using Sprayway’s new loose blown synthetic insulation, these warm insulated jackets are versatile enough to be worn in a wider range of conditions. Loose blown insulation has a particularly high loft and level of heat retention, even when the fibres become damp from snow or rain. The fibres of different lengths, type and fineness are processed like down and blown into baffles where it can expand to its full loft. The narrow baffling stops the insulation from bunching or spreading out, particularly in the most crucial areas. 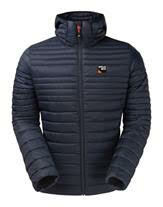 With a classic quilted design, two deep elastane pockets, and an inner zipped security pocket giving plenty of storage, as well as an elastane bound hood, hem and cuffs, the jackets give better protection from the cold, wind and light rain without the bulk and rigidity of a shell jacket.